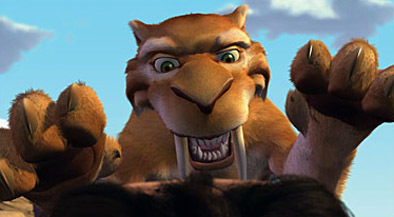 The CGI animation revolution continues with the sequel to Ice Age, where the gang of loveable prehistoric animals must deal with the coming end to the Ice Age. While the original Ice Age wasn't exactly a critical smash, and definitely not as beloved as either Shrek or most of the Pixar movies, it was a hit (opening to a very impressive $46 million in mid-March four years ago) and has also done extremely well on home video. All the big voice talent (headed by Everybody Loves Ray Romano) is back. But since it's a sequel things have to be BIGGER so several others join the party, including Queen Latifah. The only question is exactly how high will it go? Opening weekend prediction: $55 million. The 2006 Summer movie season unofficially kicks off this year with V for Vendetta, the long-awaited (and delayed) adaptation of the groundbreaking 1980s comic book miniseries from writer Alan Moore. Although the reclusive Moore has distanced himself from the movie, there is a lot of buzz and anticipation for this film, no doubt helped by a great-looking ad during the Super Bowl. The basic plot of the story is about a mysterious man (V) who uses terroristic tactics to fight against the rigid totalitarian government. The bar has been set rather high by the filmmakers - James McTeigue is officially credited as the director, but the Wachowski brothers (of The Matrix fame) were the producers. Expect many similarities to in both substance and style, though I strongly doubt that the movie will feature any special effects that are even remotely close to those in The Matrix. But it does have Natalie Portman. With a shaved head. Throw in the timely and relevant story (much debate exists about whether or not the movie was delayed from last fall due to the London bombings) and V for Vendetta is sure to be one of the hottest tickets this month. Word-of-mouth (as well as the possibility of repeat viewings) will determine its fate in the long run. Bruce Willis returns to the action genre that made him a megastar in 16 Blocks. It is a rather simple, but intriguing idea as Willis is a New York City police officer who is assigned the trivial task of escorting a witness (Mos Def) just 16 blocks to the courthouse. Unfortunately for them, there are plenty of people who don't want that to happen, so their would-be short car ride turns into an adventure. Sounds like pure Saturday afternoon fun. From director Richard Donner (of Lethal Weapon), this has breakout hit written all over it. Make no mistake, Spike Lee is a fine director. He has been behind the camera for several excellent movies, including Do the Right Thing, Malcolm X, and He Got Game. And he has worked with Denzel before, too (in Malcolm X). But given his recent box office history, and his tendency towards more incendiary films (such as Bamboozled and She Hate Me), was he really the best choice? Well, if he delivers a good, fun movie it will be a moot point. With this cast of actors, Inside Man is bound to score a sizeable opening regardless of the director. But I can't help but wonder if the fact that it is a Spike Lee joint will scare a few people away. For the love of Spaghetti Monster, isn't anything sacred anymore!?!? With the Obligatory Horror Remake of the Month is The Hills Have Eyes, a reissue of the 1977 Wes Craven thriller about a family stranded in the middle of nowhere who are stalked by a group of savages. In this update, the unfortunate souls are instead attacked by a group of some sort of vicious atomic mutants. Expect plenty of violence and gore, and an audience that skews towards young males. It should fit comfortably in the $15-$20 million range that has been set by many other interchangeable horror movies in the last couple years.